Special Legislative Concerns: taxes, game and fish. He was a member of the Church of Seven Dolars. Religion provided by the Minnesota Legislative Manual, 1979-80 and the Catholic Bulletin, 3/21/1975. Session Notes: He died while in office on January 20, 1980. 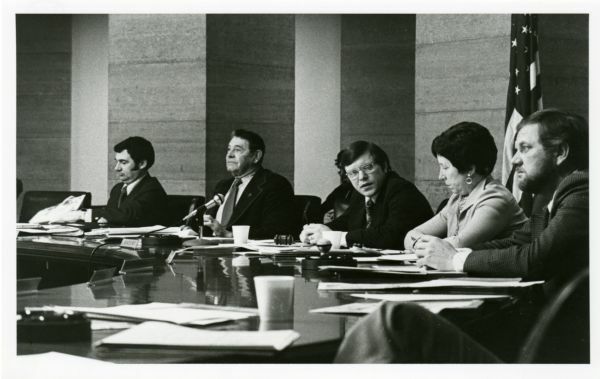 Senator Gerald Willet, Senator Ed Schrom, Senator Roger Moe, Senate staff person Ardella Tischler, and Senator Howard Olson in a Natural Resources and Agriculture committee hearing, St. Paul, Minnesota. 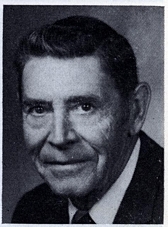 Minnesota Powerline Oral History Project: Interview with Ed Schrom, February 1, 1978. (Audio) 1978 - Available in the Minnesota Reflections Collection. Minnesota Powerline Construction Oral History Project: Ed Schrom, Narrator; Edward P. Nelson, Interviewer, Saint Paul, Minnesota: Minnesota Historical Society, 1981.